Quantity of interest in brachytherapy dosimetry is absorbed dose to water in liquid water phantom. For measurement purposes, the precise and reproducible placement of detectors in water phantom is a challenge, so various detectors and solid phantoms are used which are probably not water equivalent. At the brachytherapy photon energies, a given solid phantom will alter the attenuation and scattering characteristics of photons as compared to the liquid water phantom. Hence, detector response changes with the type of the solid phantom and the distance from the source to the point of measurement in the phantom. Selvam et al. reported methodologies for calculating beam quality correction, KQQ0 (r), and phantom scatter correction Kphan (r), for different solid phantoms. Using these methodologies, the authors calculated the above corrections for various detector materials and solid phantoms at the 137 Cs energy. In another study by Subhalaxmi and Selvam, correction factors KQQ0 (r) and Kphan (r) were reported for various solid-state detectors for 60 Co and 192 Ir brachytherapy sources. The purpose of this study is to calculate KQQ0 (r) and Kphan (r) for lithium formate EPR dosimeter for high-energy brachytherapy sources 169 Yb,192 Ir,137 Cs, and 60 Co. This study also includes comparison of KQQ0 (r) and Kphan (r) values of lithium formate detector with the previously published values of other solid-state detectors such as diamond and LiF at 60 Co,137 Cs, and 192 Ir energies., Investigation of KQQ0 (r) and Kphan (r) values of Li2B4O7 detector at 169 Yb energies is also included in the present study for comparison against lithium formate. The EGSnrc-based  user-codes DOSRZnrc and FLURZnrc  are used in the study. It must be noted that Kphan (r) values for different detectors as reported in our previously published studies , at 60 Co,137 Cs, and 192 Ir energies were based on phantom dimensions of 40 cm diameter×40 cm height, whereas in the present study involving lithium formate detector, the phantom dimensions involved are 160 cm diameter×160 cm height for 60 Co, and 80 cm diameter×80 cm height for 137 Cs,192 Ir, and 169 Yb. This approach is consistent with the guidelines on phantom dimensions recommended in the report of AAPM and ESTRO. Hence, we repeated the calculations of Kphan (r) for diamond, Li2B4O7, and LiF at 60 Co,137 Cs, and 192 Ir energies for a meaningful comparison against lithium formate. It is found that phantom dimensions do not significantly affect the correction factors; hence, it is not discussed in this study. The brachytherapy sources investigated in this study are BEBIG high-dose rate (HDR)60 Co (model Co0.A86), 137Cs(model RTR), HDR 192 Ir (model MicroSelectron), and HDR 169 Yb (model 4140). The photon energy spectra of 169 Yb and 192 Ir needed for the Monte Carlo calculations were taken from literature., For the 60 Co source, two gamma lines 1.17 MeV and 1.33 MeV were considered. For the 137 Cs source, a photon of energy 0.662 MeV was used. The solid phantom materials investigated are polymethylmethacrylate (PMMA), polystyrene, solid water, virtual water, plastic water, RW1, RW3, A150, and WE210. [Table 1] presents the elemental composition, <Z/A> (electron density), and ρ (mass density) of the investigated phantom materials including water. The atomic composition and density details of RW1 and virtual water phantoms were taken from the published studies., The data on the remaining phantoms were taken from a study by Seco and Evans. Here, Dw, Q (r) and Ddet, Q (r) are the absorbed dose to water and absorbed dose to detector in liquid water at a distance r along the transverse axis of the photon emitting brachytherapy source of beam quality Q, respectively. Dw, Q0 and Ddet, Q0 are the absorbed dose to water and absorbed dose to detector in water at the reference beam quality Q0 (realistic 60 Co teletherapy beam), respectively. Ddet, phan, Q (r) is the absorbed dose to detector in the solid phantom at r from the brachytherapy source of beam quality Q. The values of the Monte Carlo parameters AE, AP, ECUT, PCUT, and ESAVE used in the FLURZnrc calculations were 0.521, 0.01, 0.01, 2, and 2 MeV, respectively. In the case of DOSRZnrc calculations, the value of ECUT used was 0.521 MeV (10 keV kinetic energy of electrons) and the values of other parameters were the same as that used in the FLURZnrc simulations. The parameters AE and AP were the low-energy thresholds for the production of knock-on electrons and secondary bremsstrahlung photons, respectively. The parameters ECUT and PCUT are electron and photon transport cutoff, respectively. ESAVE is a parameter related to the range rejection technique. Up to 109, photon histories were simulated. The 1-σ statistical uncertainties on the calculated absorbed dose and collision kerma values were about 0.2%. The statistical uncertainties on the calculated values of KQQ0 (r) and Kphan (r) were <0.5%. KQQ0 (r) is about unity and distance independent for 60 Co,137 Cs, and 192 Ir brachytherapy sources, whereas for the 169 Yb source, KQQ0 (r) increases gradually to about 4% larger than unity for lithium formate dosimeter at a distance of 15 cm along the transverse axis of the source which is presented in [Figure 1]. When these results are compared with the published , values of other solid-state detectors such as diamond, LiF, and Li2B4O7, it is observed that KQQ0 (r) values of lithium formate are identical with the corresponding values of Li2B4O7 detector at all distances for all the above sources. This is because of the fact that these two dosimeters have very similar dosimetric properties. For example, the effective atomic number and <Z/A> of lithium formate (7.23 and 0.514) are comparable to that of Li2B4O7 (7.40 and 0.485) detector. The mass energy-absorption coefficient values of lithium formate (μen/ρ)LiFo are only 6% higher to that of (μen/ρ)Li2B4O7 in the energy range 10 keV to 1.5 MeV. Although the absolute values differ by 6%, KQQ0 (r) values of these two detectors are identical, because KQQ0 (r) is the ratio of absorbed dose to water and detector for a given beam quality normalized with the same ratio for the reference beam [Equation 1]. Hence, the ratio of absorbed dose to lithium formate and Li2B4O7 at Q is equal to the same ratio at Q0 which results in identical KQQ0 (r) values for these two detectors. Figure 1: Beam quality correction, KQQ0 (r), presented for lithium formate and Li2B4O7detectors as a function of distance along the transverse axis of the 169Yb brachytherapy source. 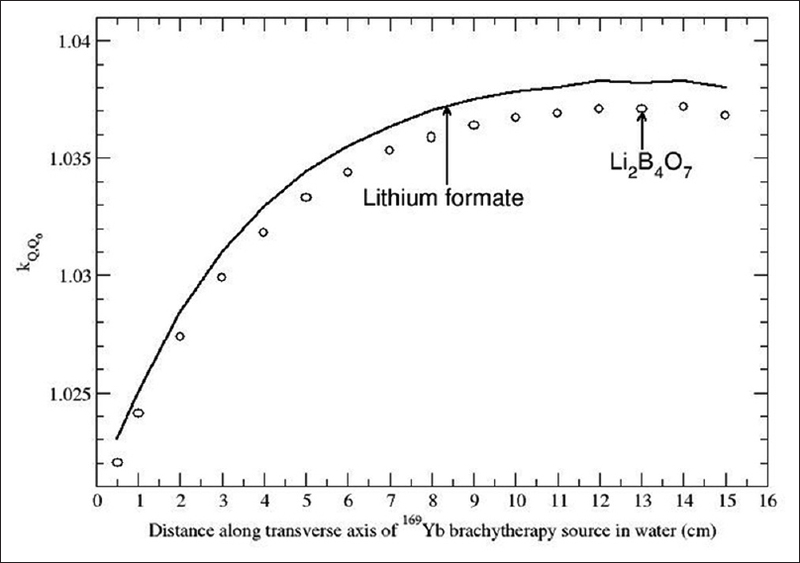 KQQ0 (r) values of diamond and LiF are also identical with that of lithium formate for 60 Co and 137 Cs brachytherapy sources. However, for 192 Ir and 169 Yb sources, diamond and LiF KQQ0 (r) values are different from lithium formate detector (about 6% and 28% larger than unity at 15 cm for diamond detector for 192 Ir and 169 Yb, respectively). The collision kerma to the detector at a distance r from the source in a phantom is due to both primary and scattered photons. The collision kerma due to primary photons is characterized by exponential attenuation of the primary photons and the mass energy-absorption coefficient (μen/ρ) of the detector at the primary photon energy. To understand the variations in the primary component of collision kerma, we analyzed the total linear attenuation coefficient (μ) data of photons in the energy range 10 keV-1.25 MeV for the investigated solid phantom materials and water using the state-of-the-art XCOM. [Table 2] presents the values of μ for all the phantom materials for photons in the range 10 keV-1.25 MeV. [Table 3] presents ratio of μ values of the phantom materials normalized to water for the above energy range. It must be noted that the predominant primary gamma lines involved in the present study are 50 keV (169 Yb), 300 keV (192 Ir), 662 keV (137 Cs), and 1.25 MeV (60 Co). An analysis of exponential attenuation of photons in water and the phantom materials suggests that for photon energy 50 keV and above, phantoms other than plastic water produce comparable attenuation at 1 cm. However, at 15 cm distance, the low-energy photons (below 50 keV) show significant variations in exponential attenuation by the phantom materials (other than WE210 at 50 keV) as compared to water. For photons of energies 300 keV and above, all the phantoms other than PMMA, A150, and WE210 demonstrate a comparable attenuation as compared to water (attenuation by polystyrene is larger by 5% at 300 keV as compared to water). The phantoms PMMA and A150 show higher attenuation than water. For example, for photon energy 1.25 MeV, PMMA and A150 phantoms demonstrate attenuation larger by factors of 1.16 and 1.11, respectively, at distance of 15 cm when compared to water. It can be noted that the above analysis of exponential attenuation of photons in the phantom materials has direct influence on the primary component of the collision kerma. Quantification of collision kerma due to scattered photons is complex as it would depend on several factors such as fraction of photons that would undergo interactions such as photoelectric effect, Rayleigh scattering, Compton scattering, and pair production (for the photon energies investigated in the present study, pair production is not important). For example, a photon with an initial energy hv0 making a contribution at the detector location through Compton scattering depends on the following: (a) the spatial point in the phantom at which Compton scattering occurs, (b) probability that the scattered photon passes through the detector location which includes exponential attenuation of scattered photon energy between the scattering point and the detector, and (c) mass energy-absorption coefficient of the detector material at the scattered photon energy. μ values at both primary and scattered photon energies play an important role in the response of the detector. The following discussion is based on an analysis of macroscopic cross section data of photons based on XCOM. We restricted the analysis down to the photon energy of 30 keV, as a primary gamma line 50 keV of 169 Yb, after consecutive three Compton scatterings, each scattering through a polar angle of 180°, would result in a scattered photon energy of only about 30 keV. In this analysis, we normalized the macroscopic cross sections such as photoelectric and Compton to the total cross section. We did this normalization for all the phantom materials. The normalized Compton cross sections of all the phantoms are comparable to that of water at photon energies 150 keV and above. 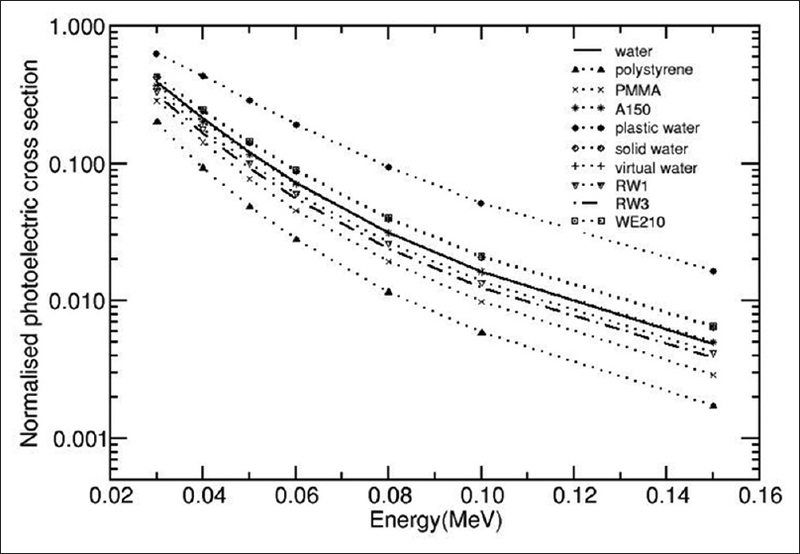 A similar analysis shows that A150, solid water, virtual water, and WE210 are comparable to that of water in the entire photon energy range of 50 keV-1.25 MeV, and RW1 and RW3 in the energy range of 80 keV-1.25 MeV. At low energies, the phantoms such as polystyrene, PMMA, A150, plastic water, RW1, and RW3 show significantly higher values of Compton cross sections. [Figure 2] presents values of Compton macroscopic cross section normalized to total cross section for the investigated phantom materials in the photon energy range 30 keV-150 keV. At 30 keV, the normalized Compton cross section values are higher by factors of 1.40, 1.20, 1.08, 1.18, and 1.15, respectively, for the phantoms polystyrene, PMMA, A150, RW1, and RW3, when compared to that of water. For solid water, virtual water, and WE210, the factor is about 0.97. Due to the presence of high atomic number elements in the plastic water, the Compton cross section at 30 keV is significantly less as compared to water (factor is 0.6). At 50 keV, the above comparison provides a factor of 1.11 for polystyrene, 1.05-1.07 for PMMA, RW1, and RW3, 1.03 for A150, and 0.99 for solid water, WE210, and virtual water. Figure 2: Macroscopic Compton cross section normalized to total macroscopic cross section as a function of photon energy. Data are based on XCOM. We have also analyzed the photoelectric cross section data of all the phantom materials. The photoelectric effect is important only at low photon energies. Hence, the comparison is restricted only in the energy range of 30-100 keV [Figure 3]. The analysis shows that the photoelectric cross sections are higher for phantom materials - plastic water, solid water, virtual water, and WE210. However, the photoelectric effect is important only for the 169 Yb source as its principal gamma line is at 50 keV (about 53% of total emission). At this energy, probability that the photon will undergo photoelectric effect is 0.12 for water and A150, 0.14 for solid water, virtual water, and WE210, about 0.10 for RW1 and RW3, and about 0.29 for plastic water. At 30 keV, the photoelectric effect is significant for all phantom materials. For example, the fractions of photons that will undergo photoelectric effect are 0.39 for water, 0.20 for polystyrene, 0.3 for PMMA, 0.37 for A150, 0.63 for plastic water, 0.42 for solid water, virtual water, and WE210, and 0.34 for RW1. Figure 3: Macroscopic photoelectric cross section normalized to total macroscopic cross section as a function of photon energy. Data are based on XCOM. In the present study, Rayleigh scattering is important only at 169 Yb energies. 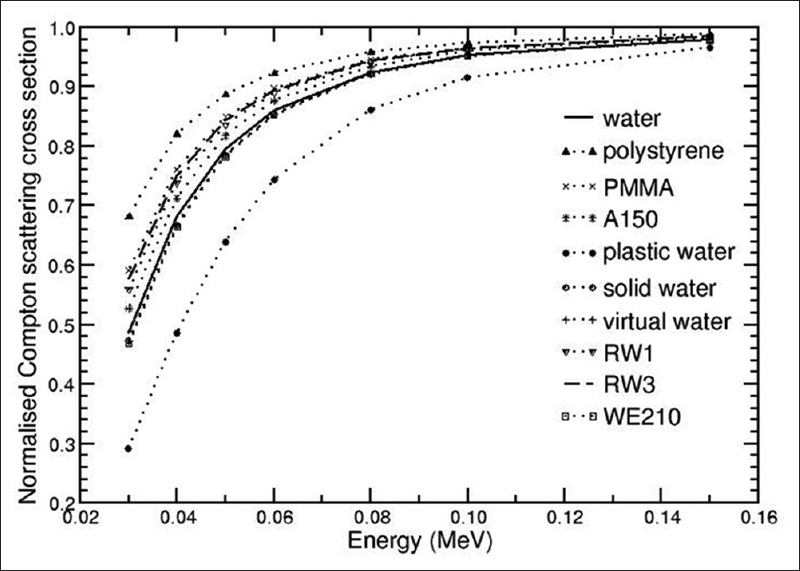 At 30 keV, water, PMMA, and polystyrene show normalized Rayleigh cross section value of about 0.12; A150, solid water, virtual water, RW1, RW3, and WE210 show a value of about 0.10. At this energy, the normalized Rayleigh scattering cross section for plastic water is 0.08. At 50 keV, all phantoms show significantly smaller cross section than water (smaller by factor of 0.75-0.86 depending on the phantom). In summary, the response of the detector material investigated in the present study is due to both primary and scattered photons. The primary component of the collision kerma dominates at short distances; hence, there is a tendency for all the phantom materials to be water equivalent at smaller distances. However, as the distance increases, the scatter contribution relative to primary is expected to increase as the primary component decreases due to inverse square fall in the primary photon fluence. Hence, depending on the photon source, the phantom materials having comparable values of μ (at both primary and scattered photon energies) and Compton scattering cross section with that of water are expected to be water equivalent. It is observed that for a given source and for a given phantom, the detectors lithium formate and Li2B4O7 exhibit similar trend of Kphan (r). Hence, in graphical presentations of Kphan (r), in addition to lithium formate, we included Li2B4O7 data (see discussion). For 60 Co source, the Kphan (r) values of diamond, LiF, and Li2B4O7 detectors are identical to that of lithium formate detector for all the investigated phantom materials. Phantoms such as polystyrene, plastic water, solid water, virtual water, RW1, RW3, and WE210 are water equivalent (i.e., Kphan (r) is unity) at all distances (1-15 cm) for lithium formate detector. This is because for these phantom materials: (a) exponential attenuation of 60 Co photons at these distances are same, and (b) Compton cross section is comparable for wide range of photon energies (150 keV-1.25 MeV), whereas PMMA and A150 phantoms show increase in Kphan (r) values with distance, which are presented in [Figure 4] (also included in this figure are results of Li2B4O7). Although these phantoms have similar Compton cross section values as that of water (80 keV-1.25 MeV), differences in the exponential attenuation of primary photons [Table 2] and [Table 3] at 1.25 MeV] result in deviation of Kphan (r) values from unity (up to about 1.05 for PMMA and 1.04 for A150 at 15 cm) as the distance increases. 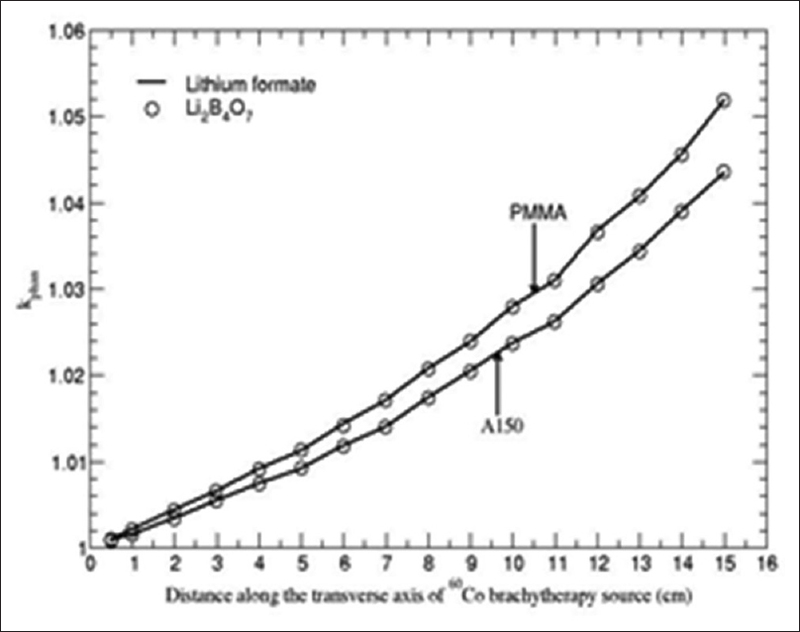 Figure 4: Phantom scatter correction, Kphan (r), presented for polymethylmethacrylate and A150 phantoms as a function of distance along the transverse axis of the 60Co brachytherapy source for lithium formate and Li2B4O7detectors. Phantoms such as solid water, virtual water, RW1, RW3, and WE210 are water equivalent at all distances (1-15 cm) for lithium formate detector. Remaining phantoms such as polystyrene, plastic water, PMMA, and A150 show distance-dependent Kphan (r) values, which are presented in [Figure 5]. Kphan (r) decreases with r for polystyrene phantom which is due to increased contribution from multiple scattered photons. At low energy, polystyrene has high Compton scattering cross section than water. For plastic water, PMMA, and A150 phantom, Kphan (r) increases with r. Both PMMA and A150 phantoms have higher μ for a wide range of photon energies (40 keV-1.25 MeV). Hence, Kphan (r) increases with r. For plastic water, the scatter contribution is affected by: (a) higher values of μ at low-energy photons (40-100 keV), (b) smaller Compton scattering cross section at low-energy photons, and (c) higher values of photoelectric cross section at low-energy photons. 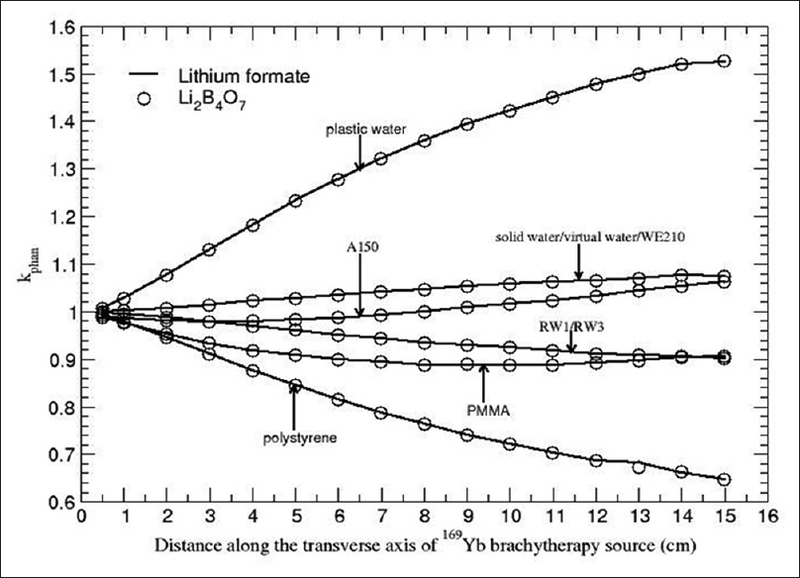 Kphan (r) values of lithium formate are identical to that of Li2B4O7 for all the phantom materials [Figure 5]. For A150 and plastic water phantoms, Kphan (r) values of diamond and LiF detectors are identical to that of lithium formate. However, for PMMA and polystyrene phantoms, the values differ with a maximum deviation of about 2% to that of lithium formate, which is not significant. 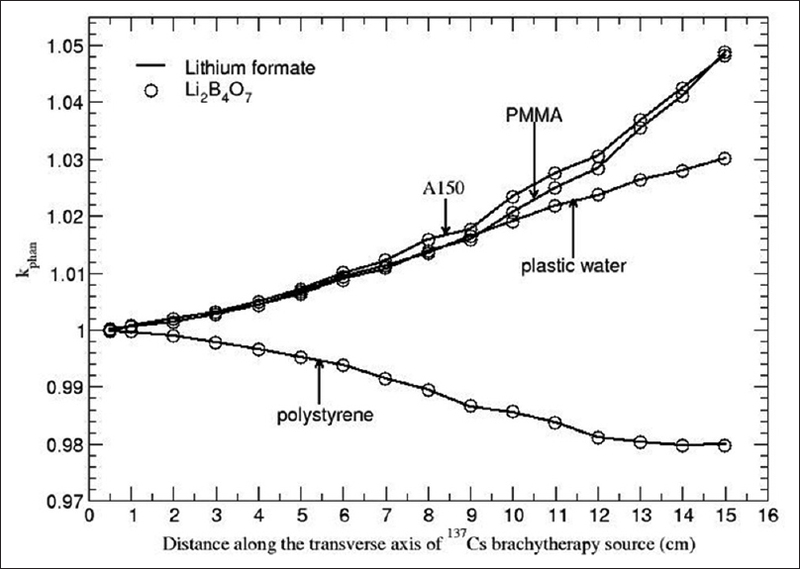 Figure 5: Phantom scatter correction, Kphan (r), presented for polymethylmethacrylate, polystyrene, plastic water, and A150 phantoms as a function of distance along the transverse axis of the 137Cs brachytherapy source for lithium formate and Li2B4O7detectors. Phantoms such as solid water, virtual water, RW1, RW3, and WE210 are water equivalent at all distances (1-15 cm) for lithium formate detector. Polystyrene, plastic water, PMMA, and A150 phantoms show distance-dependent Kphan (r) values, which are presented in [Figure 6]. Kphan (r) decreases with r (maximum up to 0.906 at 15 cm) in polystyrene phantom. Explanation given for 137 Cs is applicable for 192 Ir. However, degree of deviation of Kphan (r) values from unity is larger for 192 Ir because of increased photon scattering. For PMMA, A150, and plastic water phantoms, Kphan (r) increases with r. Kphan (r) increases to 1.026, 1.049, and 1.10 at a distance of 15 cm for PMMA, A150, and plastic water phantoms, respectively. Kphan (r) values of lithium formate are identical to that of Li2B4O7 for all the investigated phantom materials [Figure 6]. However, Kphan (r) value is higher by about 3% for diamond detector and 3% smaller for LiF detector at a distance of 15 cm to that of lithium formate detector for PMMA and polystyrene phantoms. 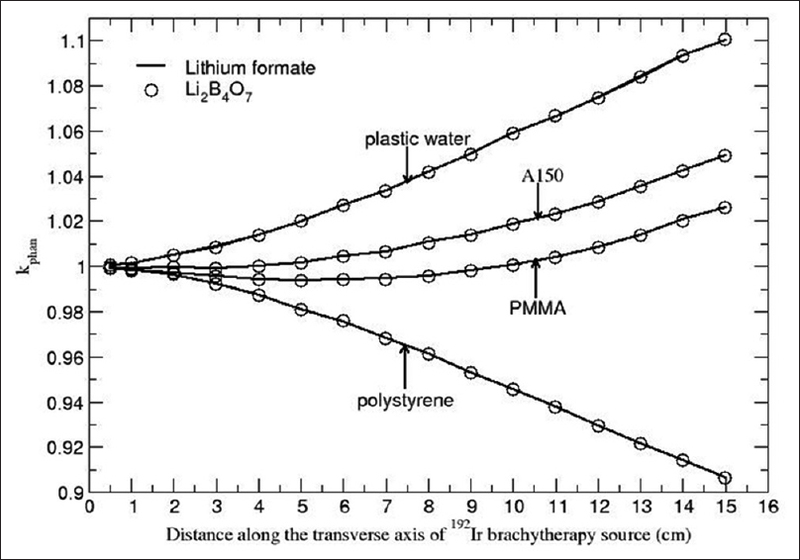 Figure 6: Phantom scatter correction, Kphan (r), presented for polymethylmethacrylate, polystyrene, plastic water, and A150 phantoms as a function of distance along the transverse axis of the 192Ir brachytherapy source for lithium formate and Li2B4O7detectors. Distance-dependent Kphan (r) values of lithium formate are presented in [Figure 7] for all the investigated phantom materials. For a given r, phantoms such as solid water, virtual water, and WE210 show statistically identical values of Kphan (r). This is because at 169 Yb energies, Compton is the predominant interaction and the cross section values of these phantoms are comparable. As the distance increases, Kphan (r) increases to about 1.07 for these phantoms. Phantoms such as PMMA, polystyrene, RW1, and RW3 show decrease in Kphan (r) values with r. However, RW1 and RW3 phantoms show a similar trend, as these two phantoms have comparable μ values and Compton cross section at the 169 Yb energies. For PMMA, Kphan (r) decreases initially, from 0.988 to 0.901 when r is increased from 1 cm to 5 cm, and thereafter it is almost constant with a value of about 0.90. For PMMA, at 169 Yb energies, values of μ and Compton scattering cross section are higher when compared to water. It appears that scattering is a major contributor of Kphan (r) than the exponential attenuation of primary photons for PMMA. Although values of μ and Compton scattering cross section for A150 phantom are comparable to that of PMMA, A150 shows a different trend in Kphan (r) values. Kphan (r) is constant (about 0.98) up to r = 6 cm and thereafter it increases to 1.06 at r = 15 cm. Thus, there is a tendency of compensation of exponential attenuation of primary photons by scatter contribution up to a distance of about 10 cm and thereafter exponential attenuation of primary photons is a major contributor of Kphan (r). This is because density of PMMA (1.19 g/cm 3) is higher than A150 (1.127 g/cm 3) which results in more number of atoms present in PMMA than in A150. As a result, there will be more number of electrons present in PMMA than in A150 which enhances number of Compton scattering events comparatively more in PMMA. Figure 7: Phantom scatter correction, Kphan (r), presented for lithium formate and Li2B4O7detectors as a function of distance along the transverse axis of the 169Yb brachytherapy source for the investigated phantom materials. For polystyrene, degree of decrease in Kphan (r) with r is significant (about 36% smaller than unity at 15 cm). This is because for this phantom: (a) μ values at 50 keV are smaller than water, and (b) Compton scattering cross section is higher than water. The plastic water phantom shows increase in Kphan (r) values with r. The degree of increase is significant for plastic water phantom (about 52% at a distance of 15 cm). This is because for this phantom at typical energy 50 keV of 169 Yb: (a) μ values are higher than water (factor is 1.24), (b) Compton scattering cross section is smaller than water (factor is 0.80), and (c) photoelectric cross section is higher by a factor of 2.34. Kphan (r) values of diamond detector are higher by 6% and 11% for PMMA and polystyrene phantoms, respectively, to that of lithium formate detector at a distance of 15 cm, whereas for plastic water phantom, it is lower by 10% as compared to lithium formate detector. For LiF detector, Kphan (r) values are lower by 4% and 7% for PMMA and polystyrene phantoms, respectively, to that of lithium formate detector. However, for plastic water phantom, it is higher by 9% as compared to lithium formate detector. This work also includes the study of angular dependence effect on the correction factors. An auxiliary simulation was carried out, in which beam quality and phantom scatter corrections were obtained for different radial distances (r = 1, 2, 5, 10 cm) and polar angles (from 0° to 90° in an increment of 10°). The calculated data were normalized to the transverse axis data. The results showed that lithium formate and Li2B4O7 did not show angular dependence for any of the investigated sources. Beam quality correction, KQQ0 (r), and phantom scatter correction, Kphan (r), for various solid phantoms were calculated for lithium formate detector as a function of distance along the transverse axis of the 60 Co,137 Cs,192 Ir, and 169 Yb brachytherapy sources using the Monte Carlo-based EGSnrc code system. KQQ0 (r) is about unity and distance independent for 60 Co,137 Cs, and 192 Ir brachytherapy sources, whereas for the 169 Yb source, KQQ0 (r) increases gradually about 4% larger than unity. For 60 Co source, phantoms such as polystyrene, plastic water, solid water, virtual water, RW1, RW3, and WE210 are water equivalent but PMMA and A150 phantoms show distance-dependent Kphan (r) values for lithium formate detector. For 137 Cs and 192 Ir sources, phantoms such as solid water, virtual water, RW1, RW3, and WE210 are water equivalent but remaining phantoms such as PMMA, plastic water, polystyrene, and A150 show distance-dependent Kphan (r) values. For 169 Yb source, all the investigated phantoms show distance-dependent Kphan (r) values for lithium formate detector. KQQ0 (r) and Kphan (r) values of lithium formate detector are identical to the corresponding values of Li2B4O7 for all the investigated sources. It is observed that as the energy of source increases, Kphan (r) values of diamond, Li2B4O7, LiF, and lithium formate are comparable. The authors would like to thank Dr. Pradeepkumar K. S. Director, Health, Safety and Environment Group, Bhabha Atomic Research Centre (BARC) and Dr. D. Datta, Head, Radiological Physics and Advisory Division, BARC, for their encouragement and support throughout the study. Selvam TP, Mishra S, Vishwakarma RS. Monte Carlo calculation of beam quality correction for solid-state detectors and phantom scatter correction at 137 Cs energy. J Appl Clin Med Phys 2014;15:4445. Subhalaxmi M, Selvam TP. Monte Carlo-based beam quality and phantom scatter corrections for solid-state detectors in 60 Co and 192Ir brachytherapy dosimetry. J Appl Clin Med Phys 2014;15:4907. Vestad TA, Malinen E, Lund A, Hole EO, Sagstuen E. EPR dosimetric properties of formates. Appl Radiat Isot 2003;59:181-8. Thomas JO, Tellgren R, Almlof J. Hydrogen bond studies: XCVL X-N map and ab initio MO-LCAO-SCF calculations of the difference electron density in non-centrosymmetric lithium formate monohydrate, LIHCOO: H2O. Acta Crystallogr 1975;31:1946-55. Vestad TA, Gustafsson H, Lund A, Hole EO, Sagstuen E. Radiation-induced radicals in lithium formate monohydrate (LiHCO2:H2O). EPR and ENDOR studies of X-irradiated crystal and polycrystalline samples. Phys Chem Chem Phys 2004;6:3017-22. Malinen E, Waldeland E, Hole EO, Sagstuen E. The energy dependence of lithium formate EPR dosimeters for clinical electron beams. Phys Med Biol 2007;52:4361-9. Antonovic L, Gustafsson H, Carlsson GA, Carlsson Tedgren A. Evaluation of a lithium formate EPR dosimetry system for dose measurements around 192Ir brachytherapy sources. Med Phys 2009;36:2236-47. Vanea ES, Levêque P, Abboud F, Bol A, Denis JM, Kolbun N, et al. Evaluation of the dose distribution gradient in the close vicinity of brachytherapy seeds using electron paramagnetic resonance imaging. Magn Reson Med 2009;61:1225-31. Adolfsson E, Carlsson GA, Grindborg JE, Gustafsson H, Lund E, Carlsson Tedgren A. Response of lithium formate EPR dosimeters at photon energies relevant to the dosimetry of brachytherapy. Med Phys 2010;37:4946-59. Waldeland E, Hole EO, Sagstuen E, Malinen E. The energy dependence of lithium formate and alanine EPR dosimeters for medium energy x rays. Med Phys 2010;37:3569-75. Kawrakow I, Mainegra-Hing E, Rogers DW, Tessier F, Walters BR. The EGSnrc Code System: Monte Carlo Simulation of Electron and Photon Transport. NRCC Report PIRS-701. Ottawa, ON: National Research Council of Canada; 2010. Rogers DW, Kawrakow I, Seuntjens JP, Walters BR, Mainegra-Hing E. NRC User Codes for EGSnrc. NRCC Report PIRS-702 (rev B). Ottawa, ON: National Research Council of Canada; 2010. Granero D, Pérez-Calatayud J, Ballester F. Technical note: Dosimetric study of a new Co-60 source used in brachytherapy. Med Phys 2007;34:3485-8. Pérez-Calatayud J, Granero D, Ballester F, Casal E, Cases R, Agramunt S. Technical note: Monte Carlo derivation of TG-43 dosimetric parameters for radiation therapy resources and 3M 137 Cs sources. Med Phys 2005;32:2464-70. Medich DC, Tries MA, Munro JJ 2nd. Monte Carlo characterization of an ytterbium-169 high dose rate brachytherapy source with analysis of statistical uncertainty. Med Phys 2006;33:163-72. Shirley VS. Nuclear Data Sheets for A=192. Nuclear data sheet. Lawrence Berkeley laboratory, Berkeley, California.1991;64:205. Reniers B, Verhaegen F, Vynckier S. The radial dose function of low-energy brachytherapy seeds in different solid phantoms: Comparison between calculations with the EGSnrc and MCNP4C Monte Carlo codes and measurements. Phys Med Biol 2004;49:1569-82. Murphy MK, Piper RK, Greenwood LR, Mitch MG, Lamperti PJ, Seltzer SM, et al. Evaluation of the new cesium-131 seed for use in low-energy x-ray brachytherapy. Med Phys 2004;31:1529-38. Seco J, Evans PM. Assessing the effect of electron density in photon dose calculations. Med Phys 2006;33:540-52. Hubbell JH, Seltzer SM. Tables of X-ray Mass Attenuation Coefficients and Mass Energy-Absorption Coefficients, National Institute of Standards and Technology, Gaithersburg, MD; 1995. Available from: http://www.physics.nist.gov/PhysRefData/XrayMassCoef. [Last accessed on 2015 Dec 04]. Berger MJ, Hubbell JH, Seltzer SM, Chang J, Coursey JS, Sukumar R, et al. XCOM: Photon Cross Sections Database, National Institute of Standards and Technology; XCOM v3.1. Available from: http://www.nist.gov/pml/data/xcom/index.cfm. [Last accessed on 2013 Aug 01].